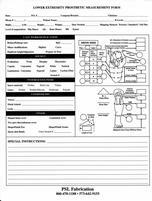 Use the links below to download an AK by Measurement form or a Lower Extremity Orthometry Form. The forms are in PDF format. If you don't have a PDF reader installed on your computer, click the Adobe link to install the lastest version. You will be redirected to Adobe's website.